Shiitake mushrooms are one of the healthiest foods on the planet. With a decent nutritional profile and some impressive health benefits, this edible mushroom is an excellent choice for any diet. Added to that, shiitake mushrooms taste delicious too. With a meaty and flavorful taste, they work well in a wide range of dishes. This article examines the beneficial nutrients these mushrooms offer, as well as a look at their more unique properties. Just how good for us are they? Pronounced ‘She-takki,’ Shiitake mushrooms (Lentinula edodes) are native to East Asia and they enjoy popularity in China, Japan, and Korea. Long considered a medicinal mushroom due to their health-promoting compounds, shiitake mushrooms have featured in traditional Eastern medicine for hundreds of years. Despite their traditional roots, commercial production of shiitake mushrooms now occurs all around the world. 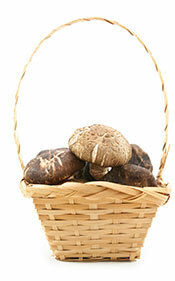 In their whole food form, we can buy shiitake mushrooms either fresh or dried. Key Point: Shiitake mushrooms are a delicious and healthy mushroom native to the Far East. However, they are now found throughout the world. Shiitake mushrooms offer a lot nutritionally, and they provide a wide range of nutrients. The tables below show the nutritional values for both the fresh (cooked) and dried forms per 100 grams (1, 2). As shown above, the dried mushrooms are much denser in calories and carbohydrate. Fresh shiitake mushrooms contain 14.4 grams of carbohydrate, as well as small amounts of fat and protein. Shiitake mushrooms supply a decent source of B vitamins. Key Point: Shiitake mushrooms supply a decent range of micronutrients and provide an excellent source of copper and selenium. Some of the benefits these mushrooms offer come from their nutrient profile, and others result from the chemical compounds the mushrooms contain. Here is an overview of the potential benefits. Can eating shiitake mushrooms boost our immune health? According to a recent trial, the answer to that question is yes. In a randomized, dietary intervention, fifty-two healthy people consumed either 5 or 10 grams of dried shiitake mushrooms every day for four weeks. Before and after the trial, the researchers drew blood samples, and the results demonstrated that regularly consuming the mushrooms reduced CRP levels (a marker of inflammation). Additionally, markers of gut immunity and cell proliferation both improved over the 4-week period (3). Key Point: In a randomized intervention, a small amount of shiitake mushrooms improved markers of immunity. Firstly, no specific food is a “cure” for cancer, so try not to read too much into these studies. That said, shiitake mushrooms contain various compounds that research demonstrates as having anti-cancer effects. Among these compounds is lentinan, a type of beta-glucan polysaccharide that displays antitumor activity (4). Notably, research on this compound has shown that high-dose extracts can “significantly decrease” the proliferation (spread) of specific types of cancer cells (5, 6). These anti-tumor compounds have also displayed beneficial effects in animal studies (7). Shiitake mushrooms provide a substantial amount of the essential mineral copper. Per 100 grams, dried mushrooms contain 258% of the RDA for this essential mineral (2). For 100 grams of fresh, cooked mushrooms, the provision is 45% of the RDA (1). Copper plays a role in various biological functions, and it is known to be essential for developing and maintaining a healthy immune system (8). Furthermore, copper deficiency has strong links to cardiovascular disease in animal studies. However, more research is necessary to determine if this is also true for humans (9, 10). Shiitake mushrooms grown naturally under the sun contain a decent source of vitamin D.
However, this will not be the case if the mushrooms were grown indoors using a grow kit and lamp. While many sources state that shiitake mushrooms only contain the (inferior) vitamin D2, this is not technically true. In fact, when the mushrooms have access to UV rays, studies show that they also produce some vitamin D3, which is the most bioavailable form of the vitamin (11). Additionally, in contrast to claims about supplemental forms of vitamin D2, obtaining the vitamin from mushrooms seems to be effective at raising plasma levels of vitamin D.
In one randomized study featuring 30 adults, a daily dose of 2000 IU vitamin D2 from mushrooms effectively raised plasma vitamin D. Overall; levels increased significantly (by more than 50%) over a 12-week period (12). 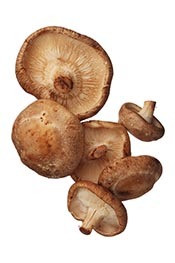 How Much Vitamin D Is In Shiitake Mushrooms? Unfortunately, it is not possible to confidently estimate how much vitamin D is in shiitake mushrooms, as this can significantly vary depending on the level of sun exposure (if any). However, vitamin D concentrations can sometimes be extremely high. For instance, dried shiitake mushrooms grown with full sun exposure may offer amounts as high as 46,000 IU per 100 grams. Key Point: Shiitake mushrooms are one of the best food sources of vitamin D.
A variety of research shows that shiitake mushrooms contain compounds that have anti-inflammatory properties. Researchers believe these anti-inflammatory effects are due to compounds such as ergothioneine and polysaccharides (13, 14). However, having anti-inflammatory properties and being proven at reducing inflammation in humans are two distinctly separate things. While some studies (in vivo and in vitro) show evidence that shiitake mushrooms modestly decrease inflammation in human subjects, further evidence is needed (15, 16, 17). We can often hear exaggerated claims about almost every food having some impact on weight loss. However, with shiitake mushrooms, there does seem to be something real behind the claims. For example, in rat studies, shiitake mushrooms increases fat elimination into faeces and helps to prevent fat deposition (18). Weight loss appears to happen in humans too. In a 1-year randomized clinical trial, participants were split into two groups; one group consumed a standard diet featuring red meat, and the second group replaced red meat with shiitake mushrooms. After the 1-year trial period, participants following the mushroom diet weighed 7 lbs less than baseline. Additionally, they had an improved body composition, lipid profile, and levels of inflammatory markers compared to the red meat group (19). Note: this does not mean we should cut red meat out of the diet; it is a nutrient-dense and healthy food. However, it does show that shiitake mushrooms have some exciting benefits. Key Point: Shiitake mushrooms appear to support weight loss in animal studies and human clinical trials. So far, we have seen that shiitake mushrooms can have anti-inflammatory and anti-cancer effects. To add one more to the list; these mushrooms have anti-bacterial and anti-fungal properties too. In one study, an extract of shiitake mushrooms exhibited strong antimicrobial activity against 85% of bacteria tested against (20). Other studies demonstrate that shiitake’s antimicrobial activities are effective against a wide range of mold, yeasts, and fungi (21, 22). It is difficult to ascertain what, if any, demonstrable positive effect this could have on humans. However, it is just another useful point about this mushroom and adds to the collective benefits. It may also contribute to shelf-life and better preservation of the nutrients and chemical compounds in the dried mushrooms. Key Point: Shiitake mushrooms have proven antimicrobial properties. These mushrooms are incredibly flavorful, and they have a meaty and spongy flavor and texture. Also, they do an excellent job of soaking up flavors, and they will take on some of the taste of what they are being cooked alongside. As a result of this, shiitake mushrooms sometimes play a part in vegetarian and vegan meat replacements. Interestingly, they even supply a rare non-animal source of vitamin B12 (though only in trace amounts). For those who do not know about these mushrooms, there are several available options if you want to give them a try. I think the mushrooms taste better in their fresh state, and they have a more enjoyable texture. Depending on location, you may be able to find these in a local supermarket or grocery store. If not, it is worth checking in any local Chinese or Korean (or general East Asian) stores. Compared to the fresh mushrooms, dried shiitake mushrooms have a more concentrated flavor, and they are slightly chewier. On the positive side, they also provide a much higher concentration of vitamins and minerals. It should be easy to find shiitake mushrooms in a Chinese or Korean store. However, they are also available online if anyone has difficulty sourcing them. It is also possible to buy extracts of shiitake mushrooms in supplemental form. These options provide a highly concentrated source of the compounds in the mushrooms. Since the supplements are a little expensive, I would personally opt for the whole dried mushrooms rather than supplements. However, a range of supplements can be found here. Key Point: We can buy shiitake mushrooms in various forms; it is probably better to buy the whole food version since they are better value and likely healthier. Firstly, there is no real limitation to how you can use these mushrooms. Fresh shiitake mushrooms taste delicious after sauteing them with a bit of butter. That said, they taste great no matter what you cook them with. Cooking with dried shiitake mushrooms is a little different to using the fresh form. Since they are very hard, these dried mushrooms need soaking to allow them to rehydrate. To do this, put them in a bowl and cover in water. As the mushrooms re-hydrate, the water levels will fall, so be sure to use a decent amount of water. After a minimum soaking time of one hour, the mushrooms will be soft and ready to use for cooking. Note: if you need to re-hydrate the mushrooms quickly, then cover them with boiling water. Doing this will reduce the soaking time to around 20 minutes or so. Once the mushrooms are soft, they can be used in the same ways as the fresh variety. Key Point: Shiitake mushrooms taste delicious in a wide range of dishes, but the dried form needs soaking in water before using them in cooking. Shiitake mushrooms are a delicious and healthy food with an assortment of interesting benefits. Whether its the fresh or dried mushrooms does not matter, and they are both healthy choices. All in all, these mushrooms can add a lot to the average diet.